Comfortable, with cheery morning light. 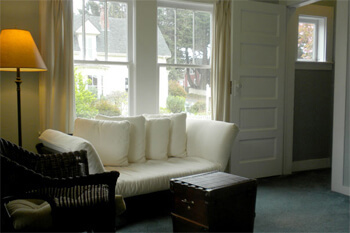 There is a queen bed in the bedroom and a single sized futon in the separate sitting room. The private bathroom has a shower. Village view featuring the beautifully restored Victorian across the street. For your convenience, a refrigerator, a microwave oven and a coffee maker are provided as well as plenty of locally roasted, organic Thanksgiving Coffee and a selection of organic Numi Teas. A warm, freshly made continental breakfast is delivered to your door in the morning. Prices are for double occupancy. An additional person over 5 years old is $25 extra per night. Maximum occupancy is three persons.